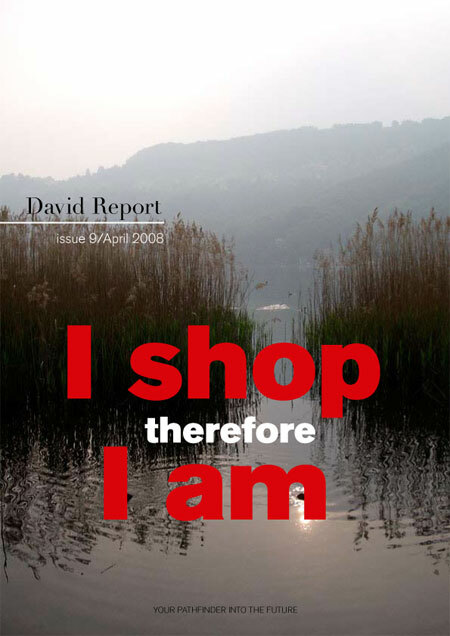 I’m proud to announce the new David Report bulletin called “I shop therefore I am”. 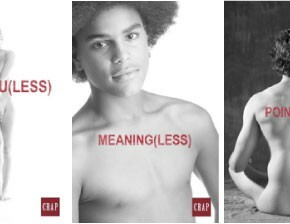 In this issue we are looking into the world of consumer culture from different point of views; ethical, social, political, economical and humanistic. Shopping has turned into a lifestyle. We consume as leisure and a way to pass time. But at the same time many are realizing that the power of consumption is stopping us from finding true and sincere happiness; and that shopping often works as a substitute for something that we’re missing in life. At what point does the accumulation of material goods become less fulfilling and more stressful and overwhelming? Our consumption grows in the same pace as our economic growth. Studies shows that in hundred years we consume eight times as much per capita as today. Can our globe take such a strain? The power of consumption is being questioned and there’s a change in attitude and way of life. We don’t want to be consuming goofs, we want to be considered aware and responsible. It is all about WHAT we buy and WHAT we choose to invest in, the world we live in will be the result of those choices. In the future consumption will be more about experiences and services than things. Perhaps giving will be more important than having. Are the companies, who survive on our consumption, prepared for this transition? The David Report bulletin no 9 “I shop therefore I am” also offers insight on the subject from strategist Kristina Dryza and Zen-Buddhist Sante Poromaa. On top of this an interview with Mathilda Tham, guest professor at Beckmans school of Design. THIS LINK takes you to the new bulletin (and yes, it’s free!). Is shopping a solution to human suffering?